Can’t fault you, this is indeed provocation enough to covet your neighbour’s tomatoes. If she repeats this with her morels next year, I shall take it as an out and out incitement to commit myco-larceny. Btw, I’m sure you will never run out of something interesting to do if I wish you two more scores of Birthday celebrations to come. bettyq, this is wonderful! i’m envious too! Oh my!! Those are so sweet and tasty! I can close my eyes and imagine BettyQs garden. So Zen. At any rate, we are getting to the point of being tomatoed? out. I have half a freezer full of Mrs. Hazan’s tomato sauce, tomato juice, tomato consomme, MM’s oven semi dried tomatoes, smoked tomato vinaigrette. 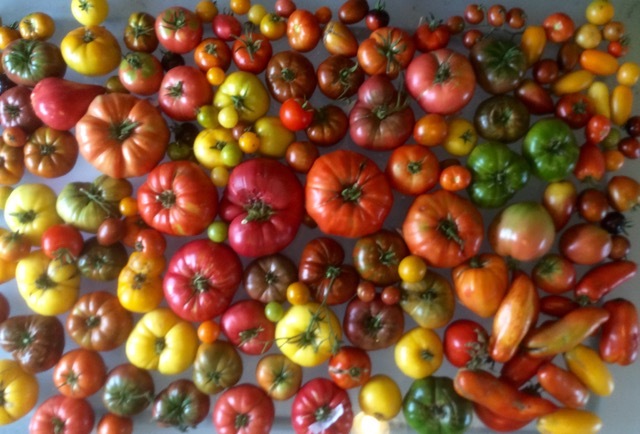 Kaya La Emp….pakitanong please kina Cwid, Mrs.P and your dinner group if they would like to taste these tomatoes. And anybody else in my neck of the woods, just holler and where I can meet you! Oh …and Footloose…come fall, I will time it and fly over to where you are and bring a duffle bag full of whatever I can find of those edible beauties in the forest. Are you up to it? Beautiful! So much diversity in a single garden, Betty Q. Thanks for sharing MM! Can you send pictures of your garden too? I am green, red, yellow, orange, and purple with envy! That is one spectacular harvest, bettyQ! ms Betty, me too, inggit to the max. I’m from Mill Creek, Wa, 45 mins from Seattle. I’m hoping to connect with you. My email is dahlia0803@gmail.com. I’m new here, almost 2 years pa lang. But I started gardening and still have a lot to learn. Hope to hear from you. God bless!